Promotes the development and sharing of practical drug development knowledge and sterile technology by agency and industry experts alike. 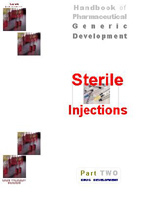 This advanced Handbook of Pharmaceutical Generic Development (in two parts) covers the key essential aspects of the development, formulation and manufacture and all intermediate and final validation processes for the development and manufacture of sterile injections. It promotes the development and sharing of practical drug development knowledge and sterile dose technology from government agency and industry experts alike. Handbook includes Table of Contents for both US and EU eCTD and CTD modules and complete module examples. Covering pharmaceutical drug development by providing hands-on easy-to-understand current know-how for the sterile product development, formulation, container closure, scale-up, process optimisation and qualification, Sterile GMP, aseptic procedures, stability, pivotal and comercial validation procedures of sterile batch lots (Aqueous and lyophilized) with supporting SOPs, protocols and checklists at every development and processing stage. Includes IQ, OQ, PQ and equipment validation and comprehensive validation checklists up to end-process validation, analytical, cleaning and process validation, critical and essential documentation peppered with extensive legal and regulatory know-how that is essential for a first time successful review for a FDA approval, saving queue-time and lost market sales. Provides essential injection technology know-how on all aspects of Development, Formulation, Scale-up, Process Optimization & Qualification; Pivotal and large scale Validation batches; analytical, cleaning and process validation; essential documentation and OGD regulatory know-how so essential for a successful review for a FDA approval, saving time and money.